Prokaryotic organisms were the first living things on earth and still inhabit every environment, no matter how extreme. All living things can be classified into three main groups called domains; these include the Archaea, the Bacteria, and the Eukarya. Prokaryotes arose during the Precambrian Period 3.5 to 3.8 billion years ago. Prokaryotic organisms can live in every type of environment on Earth, from very hot, to very cold, to super haline, to very acidic. The domains Bacteria and Archaea are the ones containing prokaryotic organisms. The Archaea are prokaryotes that inhabit extreme environments, such as inside of volcanoes, while Bacteria are more common organisms, such as E. coli. In the recent past, scientists grouped living things into five kingdoms (animals, plants, fungi, protists, and prokaryotes) based on several criteria such as: the absence or presence of a nucleus and other membrane-bound organelles, the absence or presence of cell walls, multicellularity, etc. In the late 20th century, the pioneering work of Carl Woese and others compared sequences of small-subunit ribosomal RNA (SSU rRNA) which resulted in a more fundamental way to group organisms on earth. Based on differences in the structure of cell membranes and in rRNA, Woese and his colleagues proposed that all life on earth evolved along three lineages, called domains. The domain Bacteria comprises all organisms in the kingdom Bacteria, the domain Archaea comprises the rest of the prokaryotes, and the domain Eukarya comprises all eukaryotes, including organisms in the kingdoms Animalia, Plantae, Fungi, and Protista. The current model of the evolution of the first, living organisms is that these were some form of prokaryotes, which may have evolved out of protobionts. In general, the eukaryotes are thought to have evolved later in the history of life. However, some authors have questioned this conclusion, arguing that the current set of prokaryotic species may have evolved from more complex eukaryotic ancestors through a process of simplification. Others have argued that the three domains of life arose simultaneously, from a set of varied cells that formed a single gene pool. Two of the three domains, Bacteria and Archaea, are prokaryotic. Based on fossil evidence, prokaryotes were the first inhabitants on Earth, appearing 3.5 to 3.8 billion years ago during the Precambrian Period. These organisms are abundant and ubiquitous; that is, they are present everywhere. In addition to inhabiting moderate environments, they are found in extreme conditions: from boiling springs to permanently frozen environments in Antarctica; from salty environments like the Dead Sea to environments under tremendous pressure, such as the depths of the ocean; and from areas without oxygen, such as a waste management plant, to radioactively-contaminated regions, such as Chernobyl. Prokaryotes reside in the human digestive system and on the skin, are responsible for certain illnesses, and serve an important role in the preparation of many foods. 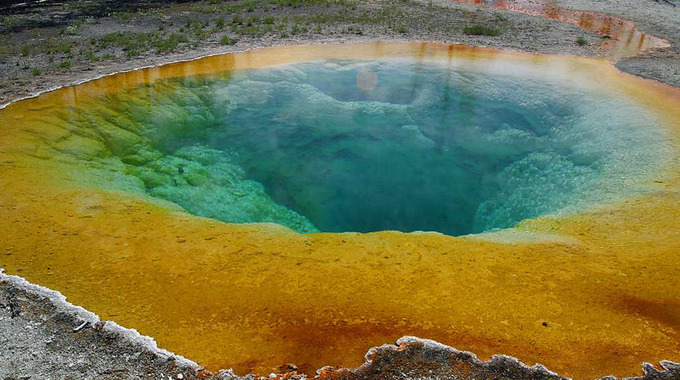 Prokaryotes in extreme environments: Certain prokaryotes can live in extreme environments such as the Morning Glory pool, a hot spring in Yellowstone National Park. The spring’s vivid blue color is from the prokaryotes that thrive in its very hot waters. Archaea are believed to have evolved from gram-positive bacteria and can occupy more extreme environments. The first prokaryotes were adapted to the extreme conditions of early earth. It has been proposed that archaea evolved from gram-positive bacteria as a response to antibiotic selection pressures. Microbial mats and stromatolites represent some of the earliest prokaryotic formations that have been found. When and where did life begin? What were the conditions on earth when life began? Prokaryotes were the first forms of life on earth, existing for billions of years before plants and animals appeared. The earth and its moon are thought to be about 4.54 billion years old. This estimate is based on evidence from radiometric dating of meteorite material together with other substrate material from earth and the moon. Early earth had a very different atmosphere (contained less molecular oxygen) than it does today and was subjected to strong radiation; thus, the first organisms would have flourished where they were more protected, such as in ocean depths or beneath the surface of the earth. Also at this time, strong volcanic activity was common on Earth. It is probable that these first organisms, the first prokaryotes, were adapted to very high temperatures. Early earth was prone to geological upheaval and volcanic eruption, and was subject to bombardment by mutagenic radiation from the sun. The first organisms were prokaryotes that could withstand these harsh conditions. Although probable prokaryotic cell fossils date to almost 3.5 billion years ago, most prokaryotes do not have distinctive morphologies; fossil shapes cannot be used to identify them as Archaea. Instead, chemical fossils of unique lipids are more informative because such compounds do not occur in other organisms. Some publications suggest that archaean or eukaryotic lipid remains are present in shales dating from 2.7 billion years ago. Such lipids have also been detected in Precambrian formations. The oldest such traces come from the Isua district of west Greenland, which include earth’s oldest sediments, formed 3.8 billion years ago. The archaeal lineage may be the most ancient that exists on earth. Within prokaryotes, archaeal cell structure is most similar to that of gram-positive bacteria, largely because both have a single lipid bilayer and usually contain a thick sacculus of varying chemical composition. In phylogenetic trees based upon different gene / protein sequences of prokaryotic homologs, the archaeal homologs are more closely related to those of Gram-positive bacteria. Archaea and gram-positive bacteria also share conserved indels in a number of important proteins, such as Hsp70 and glutamine synthetase. It has been proposed that the archaea evolved from gram-positive bacteria in response to antibiotic selection pressure. This is suggested by the observation that archaea are resistant to a wide variety of antibiotics that are primarily produced by gram-positive bacteria and that these antibiotics primarily act on the genes that distinguish archaea from bacteria. The evolution of Archaea in response to antibiotic selection, or any other competitive selective pressure, could also explain their adaptation to extreme environments (such as high temperature or acidity) as the result of a search for unoccupied niches to escape from antibiotic-producing organisms. Microbial mats or large biofilms may represent the earliest forms of life on earth; there is fossil evidence of their presence starting about 3.5 billion years ago. A microbial mat is a multi-layered sheet of prokaryotes that includes mostly bacteria, but also archaea. Microbial mats are a few centimeters thick, typically growing where different types of materials interface, mostly on moist surfaces. The various types of prokaryotes that comprise the mats use different metabolic pathways, which is the reason for their various colors. Prokaryotes in a microbial mat are held together by a glue-like sticky substance that they secrete called extracellular matrix. Microbial mat: This (a) microbial mat, about one meter in diameter, grows over a hydrothermal vent in the Pacific Ocean in a region known as the “Pacific Ring of Fire.” The mat helps retain microbial nutrients. Chimneys, such as the one indicated by the arrow, allow gases to escape. (b) In this micrograph, bacteria are visualized using fluorescence microscopy. The first microbial mats likely obtained their energy from chemicals found near hydrothermal vents. A hydrothermal vent is a breakage or fissure in the earth’s surface that releases geothermally-heated water. With the evolution of photosynthesis about 3 billion years ago, some prokaryotes in microbial mats came to use a more widely-available energy source, sunlight, whereas others were still dependent on chemicals from hydrothermal vents for energy and food. Fossilized microbial mats represent the earliest record of life on earth. A stromatolite is a sedimentary structure formed when minerals are precipitated out of water by prokaryotes in a microbial mat. Stromatolites form layered rocks made of carbonate or silicate. Although most stromatolites are artifacts from the past, there are places on earth where stromatolites are still forming. For example, growing stromatolites have been found in the Anza-Borrego Desert State Park in San Diego County, California. Stromatolites: (a) These living stromatolites are located in Shark Bay, Australia. (b) These fossilized stromatolites, found in Glacier National Park, Montana, are nearly 1.5 billion years old. Prokaryotes are well adapted to living in all types of conditions, including extreme ones, and prefer to live in colonies called biofilms. Prokaryotes live in all environments, no matter how extreme they may be. Bacteria that prefer very salty environments are called halophiles, while those that live in very acidic environments are called acidophiles. An example of a habitat that halophiles can colonize is the Dead Sea, a body of water that is 10 times saltier than regular ocean water. A biofilm is a microbial community held together in a gummy-textured matrix that consists primarily of polysaccharides secreted by the organisms. Biofilms can be found clogging pipes, on kitchen counters, or even on the surface of one’s teeth. Some organisms have developed strategies that allow them to survive harsh conditions. Prokaryotes thrive in a vast array of environments; some grow in conditions that would seem very normal to us, whereas others are able to thrive and grow under conditions that would kill a plant or animal. Almost all prokaryotes have a cell wall: a protective structure that allows them to survive in both hyper- and hypo-osmotic conditions. Some soil bacteria are able to form endospores that resist heat and drought, thereby allowing the organism to survive until favorable conditions recur. These adaptations, along with others, allow bacteria to be the most abundant life form in all terrestrial and aquatic ecosystems. 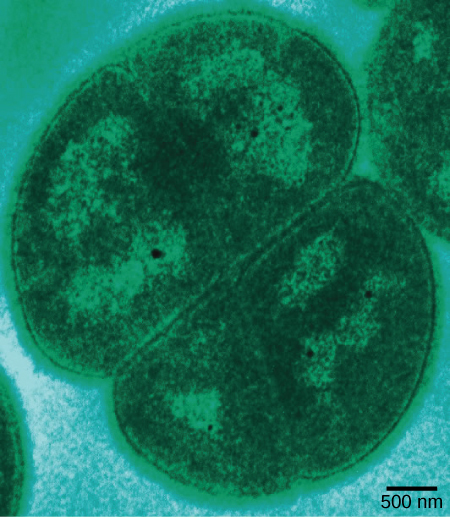 Bacteria and radiation tolerance: Deinococcus radiodurans, visualized in this false color transmission electron micrograph, is a prokaryote that can tolerate very high doses of ionizing radiation. It has developed DNA repair mechanisms that allow it to reconstruct its chromosome even if it has been broken into hundreds of pieces by radiation or heat. Other bacteria and archaea are adapted to grow under extreme conditions and are called extremophiles, meaning “lovers of extremes.” Extremophiles have been found in all kinds of environments: the depth of the oceans, hot springs, the Arctic and the Antarctic, in very dry places, deep inside earth, in harsh chemical environments, and in high radiation environments, just to mention a few. These organisms give us a better understanding of prokaryotic diversity and raise the possibility of finding new prokaryotic species that may lead to the discovery of new therapeutic drugs or have industrial applications. Because they have specialized adaptations that allow them to live in extreme conditions, many extremophiles cannot survive in moderate environments. There are many different groups of extremophiles. They are identified based on the conditions in which they grow best. Several habitats are extreme in multiple ways. For example, a soda lake is both salty and alkaline, so organisms that live in a soda lake must be both alkaliphiles and halophiles. Other extremophiles, like radioresistant organisms, do not prefer an extreme environment (in this case, one with high levels of radiation), but have adapted to survive in it. One example of a very harsh environment is the Dead Sea, a hypersaline basin that is located between Jordan and Israel. Hypersaline environments are essentially concentrated seawater. In the Dead Sea, the sodium concentration is 10 times higher than that of seawater. The water also contains high levels of magnesium (about 40 times higher than in seawater) that would be toxic to most living things. Iron, calcium, and magnesium, elements that form divalent ions (Fe2+, Ca2+, and Mg2+), produce what is commonly referred to as “hard” water. Taken together, the high concentration of divalent cations, the acidic pH (6.0), and the intense solar radiation flux make the Dead Sea a unique, and uniquely hostile, ecosystem. Halophile habitats: (a) The Dead Sea is hypersaline. Nevertheless, salt-tolerant bacteria thrive in this sea. (b) These halobacteria cells can form salt-tolerant bacterial mats. Until a couple of decades ago, microbiologists used to think of prokaryotes as isolated entities living apart. This model, however, does not reflect the true ecology of prokaryotes, most of which prefer to live in communities where they can interact. A biofilm is a microbial community held together in a gummy-textured matrix that consists primarily of polysaccharides secreted by the organisms, together with some proteins and nucleic acids. Biofilms grow attached to surfaces. Some of the best-studied biofilms are composed of prokaryotes, although fungal biofilms have also been described, as well as some composed of a mixture of fungi and bacteria. 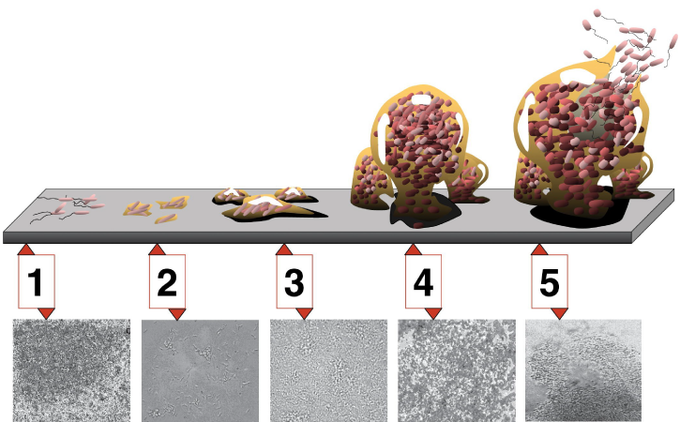 Biofilm Development: Five stages of biofilm development are shown. During stage 1, initial attachment, bacteria adhere to a solid surface via weak van der Waals interactions. During stage 2, irreversible attachment, hairlike appendages called pili permanently anchor the bacteria to the surface. During stage 3, maturation I, the biofilm grows through cell division and recruitment of other bacteria. An extracellular matrix composed primarily of polysaccharides holds the biofilm together. During stage 4, maturation II, the biofilm continues to grow and takes on a more complex shape. During stage 5, dispersal, the biofilm matrix is partly broken down, allowing some bacteria to escape and colonize another surface. Micrographs of a Pseudomonas aeruginosa biofilm in each of the stages of development are shown. Biofilms are present almost everywhere: they can cause the clogging of pipes and readily colonize surfaces in industrial settings. In recent, large-scale outbreaks of bacterial contamination of food, biofilms have played a major role. They also colonize household surfaces, such as kitchen counters, cutting boards, sinks, and toilets, as well as places on the human body, such as the surfaces of our teeth. Interactions among the organisms that populate a biofilm, together with their protective exopolysaccharidic (EPS) environment, make these communities more robust than free-living, or planktonic, prokaryotes. The sticky substance that holds bacteria together also excludes most antibiotics and disinfectants, making biofilm bacteria hardier than their planktonic counterparts. Overall, biofilms are very difficult to destroy because they are resistant to many common forms of sterilization.